warmer, more sincere than he suspected he was? Do photographic portraits have different responsibilities to the sitter than portraits in paint or prose? Isn’t it trivializing and demeaning to make someone look wise, noble (which is easy to do), or even conventionally beautiful when the thing itself is so much more complicated, contradictory, and therefore fascinating? Was he hoping that the photograph would reveal a perfect surface? Or is it just possible that he could have wished – as I would have if I were being photographed – that “being kind” would involve allowing something more complicated about me to burn through: my anger, ineptitude, strength, vanity, my isolation. If all these things are aspects of character, would I not, as an artist, be unkind to treat Kissinger as a merely noble face? Does the perfect surface have anything to do with the artistic integrity of a portrait? 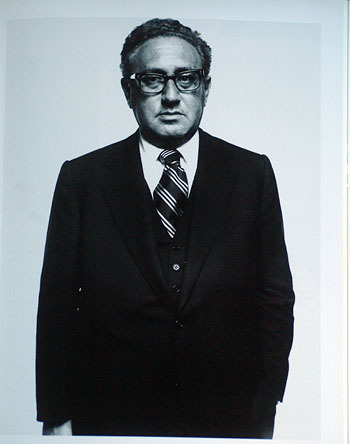 So who is Henry Kissinger? And what, or who, is this photograph? Is it just a shadow representation of a man? Or is it closer to a doppelgänger, a likeness with its own life, an inexact twin whose afterlife may overcome and replace the original? When I see my pictures in a museum and watch the way people look at my pictures, and then turn to the pictures myself and see how alive the images are, they seem to have little to do with me. They have a life of their own. Like the actors in Pirandello, or in Woody Allen’s movie The Purple Rose of Cairo, when the actors leave the screen and join the audience. They have confrontations with the viewers Photography is completely different from every other form of art. I don’t really remember the day when I stood behind my camera with Henry Kissinger on the other side. I’m sure he doesn’t remember it either. But this photograph is here now to prove that no amount of kindness on my part could make this photograph mean exactly what he – or even I – wanted it to mean. It’s a reminder of the wonder and terror that is a photograph. Richard Avedon é um dos meus fotógrafos prediletos. Aprendi a gostar dele graças ao Dante, lá no nosso estúdio fotográfico em São Paulo. "Por natureza, a alma possui uma função religiosa." 103 queries. 0,737 seconds. | Alguns direitos reservados.